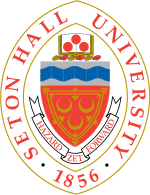 Seton Hall University is a private Roman Catholic university in South Orange, New Jersey, United States. Founded in 1856 by Archbishop James Roosevelt Bayley and named after his aunt, Saint Elizabeth Ann Seton, Seton Hall is the oldest diocesan university in the United States. Seton Hall consists of 11 schools and colleges with an undergraduate enrollment of about 5,800 students and a graduate enrollment of about 4,400. It was ranked tied for 118th in Best National Universities by U.S. News & World Report in 2017, with the School of Law ranked tied for 63rd. The Stillman School of Business was ranked 78th of 132 undergraduate business schools in the nation by Bloomberg Businessweek in 2014. The main campus of the college was originally in Madison, New Jersey. 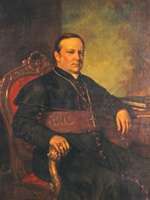 Reverend Bernard J. McQuaid served as the first college president (1856–1857, 1859–1868) and directed a staff of four diocesan clergy including Reverend Alfred Young, vice-president; Reverend Daniel Fisher (the second college president, 1857–1859) and five lay instructors. Initially, Seton Hall had only five students – Leo G. Thebaud, Louis and Alfred Boisaubin, Peter Meehan and John Moore. By the end of the first year, the student body had grown more than tenfold to 60. The college moved to its current location in 1860. On January 19, 2000, an arson fire killed three and injured 54 students in Boland Hall, a freshman residence hall on the campus in South Orange. The incident, one of the deadliest in recent US history, occurred at 4:30 am, when most students were asleep. After a three-and-a-half year investigation, a 60-count indictment charged two freshmen students, Sean Ryan and Joseph LePore, with starting the fire and felony murder for the deaths that resulted. LePore and Ryan pleaded guilty to third-degree arson and were sentenced to five years in a youth correctional facility with eligibility for parole 16 months after the start of their prison terms. Consequently, the student body dedicated an area in front of Boland Hall to those that suffered from the fire called "The Remember Seal" and stronger university fire safety precautions were executed. On the 150th anniversary (1856–2006) of the university’s founding, Seton Hall initiated the Ever Forward capital campaign to raise a total of $150 million. 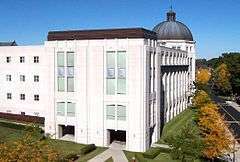 The campaign was the most prestigious building campaign in the University’s long history. The funds were directed to many areas throughout the university, however a majority went toward building and reconstructing campus facilities and historic sites. The university has completed a host of campus renovations and new construction while attracting more and better students. An initial round of improvements totaling nearly $100 million concluded in 2014 with the opening of a new fitness center, academic building, parking garage and expanded Aquinas Hall dormitory. A second round of construction is planned for 2016 and beyond. Seton Hall announced the formation of two additional academic units in 2015 – the School of Medicine and the College of Communication and the Arts. The medical school, which is expected to open in 2017 in partnership with Hackensack University Health Network, will be one of six Catholic medical schools in the United States and should address a shortage of primary care physicians in New Jersey and the surrounding region. The College of Communication and the Arts was a department in the College of Arts and Sciences before being elevated in the summer of 2015. The university, legally incorporated as “Seton Hall University, an educational corporation of New Jersey,” is governed by a 16-member Board of Trustees. Eleven members of the board serve on it as a virtue of their positions within the University or Archdiocese of Newark. The Archbishop of Newark, who serves as the President of the Board, retains the power to appoint the remaining five members of the body. Appointed members of the board serve three-year terms, until their respective successor is appointed. The Board of Trustees exclusively maintains the property rights of the university and provides selection of title, scope, and location of the schools and colleges of the university. In May 2009, Monsignor Robert Sheeran announced his resignation effective June 2010. In January 2010, a Presidential Search Committee named the Interim President and former Provost, Dr. Amado Gabriel Esteban, as the 20th President of Seton Hall. Esteban attended Harvard University’s Graduate School of Education and completed the Japan Management Program at the Japan-America Institute for Management Science. His credentials include a Ph.D. from the Graduate School of Management at the University of California at Irvine, an M.S. in Japanese Business Studies from Chaminade University in Honolulu, and an M.B.A. and B.S. in mathematics from the University of the Philippines. He is the first lay president of Seton Hall in three decades and the first Filipino to become president of an American university. The main campus of Seton Hall University is situated on 58 acres (23 ha) of suburban land on South Orange Avenue. It is home to nine of the 10 schools and colleges of the University. 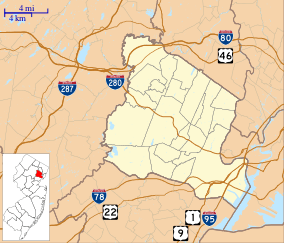 The South Orange Village center is just ½ mile (0.8 km) west of the main campus. Directly across from the main campus to the northwest are scenic Montrose Park and the Montrose Park Historic District, which is listed in the National Register of Historic Places. The Eugene V. Kelly Carriage House, on the campus itself, is also NRHP-listed. 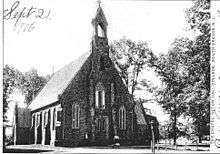 The village itself dates back to 1666 preceding the establishment of Seton Hall College. Also since the beginning of the College, the South Orange Rail Station has served as an integral means to campus commuters. The main campus combines architectural styles including Roman, neo-gothic and modern. The South Orange campus became a gated community during the University’s Modernization Period. Presidents Hall – One of the oldest buildings on campus and a flagship of the University, Presidents Hall was completed in 1867. Located at the epicenter of the main campus, Presidents Hall is a neo-gothic structure dressed in brownstone. It originally served as a seminary but now houses the University’s administration including the Office of the University President. The halls are lined with portraits of past University presidents and include a large stained glass depicting Saint Elizabeth Ann Seton, which was commissioned in 1866 by President Bayley. McQuaid Hall – Built around 1900, it was named for Bishop Bernard J. McQuaid, Seton Hall’s first President from 1856–1857 and 1859–1867. McQuaid Hall was both a boarding house for students and a convent for nuns before serving its present purpose as the home of the School of Diplomacy and International Relations as well as the Seton Hall University School of Health and Medical Sciences. 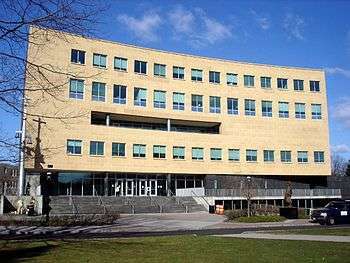 Jubilee Hall on the South Orange, NJ campus of Seton Hall University, is the home of the Stillman School of Business. McNulty Hall – Named for Msgr. John L. McNulty, President of the University from 1949–1959, McNulty Hall was built as the university’s technology and research center in 1954. One of the most famous features of the building is the “Atom Wall” a relief artwork originally located on outer façade. Following renovations completed in the summer of 2007, the Atom Wall, depicting the gift of scientific knowledge from God to man, can be seen in the glass atrium of the building. McNulty also houses a large amphitheater and observatory for the chemistry, physics and biology departments. Arts and Sciences Hall – Originally built to house the Stillman School of Business in 1973, with the creation of Jubilee Hall in 1997, the building is now home to the College of Arts and Sciences. The building is conjoined with the College of Nursing in the north wing. The College of Nursing has advanced teaching facilities including hospital beds, demonstration rooms and multi-purpose practice areas. A satellite of the main campus, the Newark Campus is home to the University’s School of Law. Located at One Newark Center, the Law School and several academic centers of the University are housed in a modern 22-story skyscraper building. 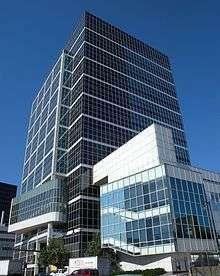 It is at the corner of Raymond Boulevard and McCarter Highway in the business and high-tech heart of downtown Newark, New Jersey and was completed in 1991. The Newark Campus building provides 210,000 square feet (20,000 m2) and an additional 65,000 square feet (6,000 m2) of library to the University. The Seton Hall University School of Law was founded in 1951. It is accredited by the American Bar Association (ABA) since 1951 and is also a member of the Association of American Law Schools (AALS). Seton Hall is one of three law schools in the state of New Jersey. Seton Hall Law was founded by a woman, Miriam T. Rooney, who served as dean from 1951 to 1961. She was not only Seton Hall’s first female dean, but was the first woman dean at an ABA-accredited law school in the United States. Dean Kathleen M. Boozang, who assumed the role in July 2015, is the third woman dean of Seton Hall Law. Seton Hall University was ranked by U.S. News & World Report in 2017 at tied for 118th in the National Universities category, with the School of Law ranked 65th best in the nation. The Stillman School of Business was ranked 78th of 132 undergraduate business schools in the nation by Bloomberg Businessweek in 2014. The school's principal newspaper is The Setonian. The paper has school news, an entertainment section called "Pirate Life," sports, editorials, and an opinion section. The staff consists of undergraduates and publishes weekly on Thursday. The Stillman Exchange is the Stillman Business school's newspaper. Its stories cover ethical issues, business, and athletic stories. The Journal of Diplomacy and International Relations is a bi-annually published journal composed of writings by international leaders in government, the private sector, academia, and nongovernmental organizations. The Liberty Bell, is the only political and independent newspaper on campus. Founded in 2007, it is published monthly and features news and op-ed articles about university, local, national, and international news with a focus on personal freedom. The Liberty Bell won the Collegiate Network's 2008–2009 award for Best New Paper, an award given to student newspapers no older than three years. WSOU is a non-commercial, college radio station, broadcasting at 89.5 MHz FM. 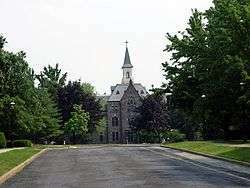 The station broadcasts from the campus of Seton Hall University in South Orange, NJ. It is a student run station with General Manager Mark Maben at helm as a full-time faculty member. WSOU currently broadcasts in HD-RADIO. In 2007, the Princeton Review rated WSOU as the eighth-best college radio station in the nation. Industry magazine also ranked WSOU to be the top Metal format station in the nation in 2007, and Rolling Stone Magazine ranked WSOU to be one of the top 5 rock stations in the nation in 2008. Seton Hall offers multiple dining options ranging from a traditional cafeteria to a food court. Some options include Build Your Own Burgers (BYOB) and Dunkin Donuts. In 2013, University officials decided that meat would not be served in the cafeteria on Ash Wednesday and Fridays during the liturgical season of Lent in practice of the abstinence of meat during the Lenten season. In 2014, the policy was implemented to all on-campus eateries. The school's sports teams are called the Pirates. They participate in the NCAA's Division I and in the Big East Conference. 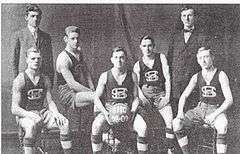 The college established its first basketball squad in 1903. Seton Hall canceled football (which was played in Division III) in 1982. Seton Hall athletics is best known for its men's basketball program, which won the National Invitation Tournament (NIT) in 1953, and lost in the finals of the 1989 NCAA Tournament to Michigan, 80–79 in overtime after a controversial call. Seton Hall currently participates at the Division I level in baseball, men's and women's basketball, men's and women's cross country running, men's and women's golf, men's and women's soccer, softball, men's and women's swimming & diving, women's tennis, and women's volleyball. Seton Hall also has club sports in ice hockey, rugby union, lacrosse, and Men's volleyball and soccer. 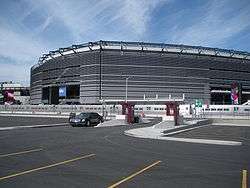 All Seton Hall sports have their home field on the South Orange campus except for the men's ice hockey team and the men's basketball team, which currently plays at the Prudential Center in Newark, New Jersey after previously calling the Meadowlands home. Seton hall had a club football team from 1965 thru 1972. In 1972 the football team won the National Club Football Championship, 96 teams nationwide competed in the National Club Football Championship. The next year, 1973, it became a Varsity sport until the highly successful team was discontinued after the 1981 season. During this period the team was coached by Ed Manigan. ↑ "Seton Hall University History". Social Science Research Network. 2007. Retrieved 2007-04-04. 1 2 "U.S. News Best Colleges Rankings". U.S. News & World Report. 2016. 1 2 "The Complete Ranking: Best Undergraduate Business Schools 2014". Bloomberg Businessweek. ↑ "The Top 5 Universities for Undergraduate Internships". International Business Times UK. 1 2 3 4 5 "Higher Education Seeks to Instill Knowledge and Faith". 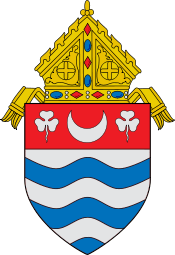 Archdiocese of Newark. 2007. Retrieved 2008-01-04. ↑ "Record Group RG/A Seton Hall College of Medicine and Dentistry 1946–1965". SHU. 2007. Retrieved 2008-01-01. ↑ "bout UMDNJ: History and Timeline". UMDNJ. 2007. Retrieved 2008-01-01. ↑ "Housing Information". SHU Housing & Residence Life. 2007. Archived from the original on December 23, 2007. Retrieved 2008-01-04. ↑ "Three Die in Dorm Fire at Seton Hall". CNN News. 2000. Archived from the original on August 7, 2004. Retrieved 2007-05-09. ↑ "Former students reach plea deal in killer dorm fire". CNN News. 2007. Archived from the original on March 25, 2007. Retrieved 2007-04-04. ↑ "Ever Forward Campaign Description". Division of University Advancement. 2007. Archived from the original on March 4, 2007. Retrieved 2007-04-04. ↑ Ever Forward Campaign completion page Archived December 24, 2007, at the Wayback Machine. ↑ "University By-Laws" (PDF). Office of Board Affairs. 2006. Retrieved 2008-01-06. ↑ "A. Gabriel Esteban Biography". APIACU. Retrieved 2016-02-25. ↑ "UP alumnus is first Pinoy president of US university". ABS-CBN News. Retrieved 2011-03-16. ↑ "The South Orange Village History". South Orange Village Website. Retrieved 2008-01-03. 1 2 3 4 5 6 7 "University Day Historical Walking Tour of Seton Hall University Facts". South Orange Historical and Preservation Society. Retrieved 2008-01-03. ↑ "Immaculate Conception Chapel at Seton Hall University". Seton Hall website. 2008. Retrieved 2016-02-26. ↑ "The Chapel of the Immaculate Conception at Seton Hall University". Granda Liturgical Arts, Inc. website. Retrieved 2016-02-26. ↑ "31 Insanely Beautiful Colleges You Can Get Married At". Buzzfeed.com. 2013. Retrieved 2016-02-26. ↑ "The 50 Most Beautiful College Campus Wedding Venues". Collegeranker.com. 2014. Retrieved 2016-02-26. ↑ "New Jersey: South Orange: Convict's Name Off Building". New York Times. 2007. Retrieved 2007-04-04. ↑ "Recycling – Seton Hall University, New Jersey". Shu.edu. 2011-03-13. Retrieved 2012-07-16. ↑ "Sustainability @ Seton Hall University | A TLTC Blog". Gogreen.shu.edu. Retrieved 2012-07-16. ↑ "Seton Hall University – Green Report Card 2011". Greenreportcard.org. 2010-03-31. Retrieved 2012-07-16. ↑ "One Newark Center". Emporis Worldwide Listing. 2006. Retrieved 2008-01-03. ↑ "Year of the Female Dean". prelaw Magazine. 2015. Retrieved 2016-02-23. ↑ "Seton Hall Law Names Kathleen Boozang as New Dean". NJ.com. 2015. Retrieved 2016-02-23. ↑ "Continuing Education and Professional Studies - Seton Hall University, New Jersey". 3.shu.edu. 2015-08-14. Retrieved 2016-03-26. ↑ "College of Communication and the Arts". Shu.edu. 2015-08-14. Retrieved 2016-03-26. ↑ "Fraternity and sorority numbers climbing amid concerns about bad publicity". NJ.com. ↑ "SHU student attacked....frat". NJ News Record. Archived from the original on July 21, 2006. Retrieved 2008-01-08. ↑ "The Gentlemen of the Hall". The Gentlemen of the Hall. ↑ "Best College Radio Rankings". The Princeton Review. 2007. Retrieved 2007-04-04. ↑ Wister, Msgr. Robert. "Saints, Monsters, Bishops and Seton Hall". mimeo. Retrieved 2007-05-09. ↑ "150 year history of Seton Hall". 2007. Archived from the original on November 26, 2007. Retrieved 2008-02-02. ↑ "The Seton Hall Pirate's Myspace". 2007. Retrieved 2007-01-07. ↑ "NCAA Division 1 Varsity Sports". Seton Hall University. Archived from the original on December 8, 2008. Retrieved 2008-01-03. ↑ "Member Schools". BIG EAST Conference Athletics. Archived from the original on December 8, 2008. Retrieved 2008-01-03. ↑ "New book spotlights history of SHU b-ball". The Setonian. Retrieved 2008-01-03. ↑ "Club Sports". Seton Hall Athletics. Retrieved 2008-01-03. ↑ "Seton Hall University Men's Basketball Joins Roster At Newark's Prudential Center". New Jersey Devils. Archived from the original on June 6, 2007. Retrieved 2007-06-18.